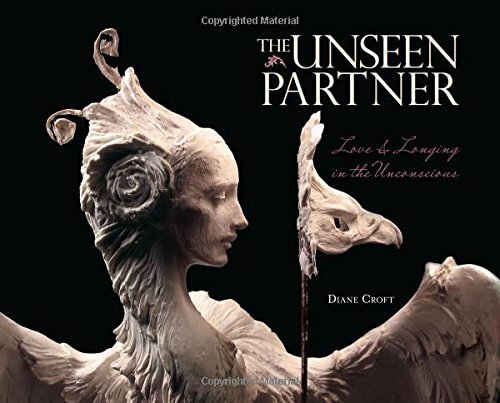 “The Unseen Partner: Love & Longing in the Unconscious” by Diane Croft is no ordinary poetry book. In fact, ‘poetry book’ falls short when used to describe it. It is a compilation of thought provoking wisdom acquired by the author’s own personal journey to discover her ‘Subconscious Self.’ Croft chose to share this wisdom through poetic symbolism and analytical commentary. Each poem extends to an image, which then extends to the authors commentary about the meaning of the poem and imagery. I found this way of sharing insight mind blowing. As a poet and poetry reader, I have enjoyed the unguided interpretation freedom of most poetry books as the poet shares their thoughts through written art. But to just ‘share’ thoughts and feelings does not seem to be the author’s goal in “The Unseen Partner.” To me, this book represents the author’s discovery of deep psychology, the wisdom within, the subconscious, the self…in other words ‘the unseen partner’ that guides us through life as that subtle entity that lives within and communicates through instinct, feelings, and symbolism. Most of us fail to listen, and it is this fact that makes the format of this book perfect. Diane Croft does an impeccable job captivating and opening the reader’s senses through the depth of her thought and the crafting of her poetry. Furthermore, she goes beyond sharing, and educating, she actually becomes a mentor herself through reflective quotes of other works and her own analytic commentary. I truly enjoyed this last part of her presentation as it helped me clearly see the author’s intention, understand the thought process through her unique lenses, and thus enrich my own thoughts and vision through the holistic expression received. Croft does this, not just on a poem-by-poem basis, but also by making the ends meet from beginning of the book to the end of the book. I found “The Unseen Partner” by Diane Croft to be a five-star must-read enlightening experience. One that should be experienced by everyone! I will be keeping my copy to re-visit and share with loved ones for sure.